Security solar flood lights are type of flood lights that uses motion sensor to detect motion in front of the light and then turn the light on. Security flood lights are also called motion sensor or motion detector solar flood lights. This is the most popular type of solar powered flood lights and are mostly used as front door lighting outside the house, as security lighting in different commercial buildings and places and simply as backyard light at your home. Solar security flood lights are also very popular among lighting manufacturers. This means that you will probably find security lights more often than any other solar floodlights. Also they are very popular among solar lamps, because motion sensor helps to improve work time for floodlight with one full charge. Light will turn on only when you need it most, in other words, when someone walks by the light. This way flood light will no illuminate without a stop and use all its charge in couple of minutes. With the large variety of different manufacturers and their products, you can easily become distracted and will not be able to answer yourself to question – Which is the best solar security flood light for my needs ? Here we have listed the top solar security flood lights, based on our and other user experience and overall popularity of the product. You can find more detailed reviews of each solar flood light in our website. 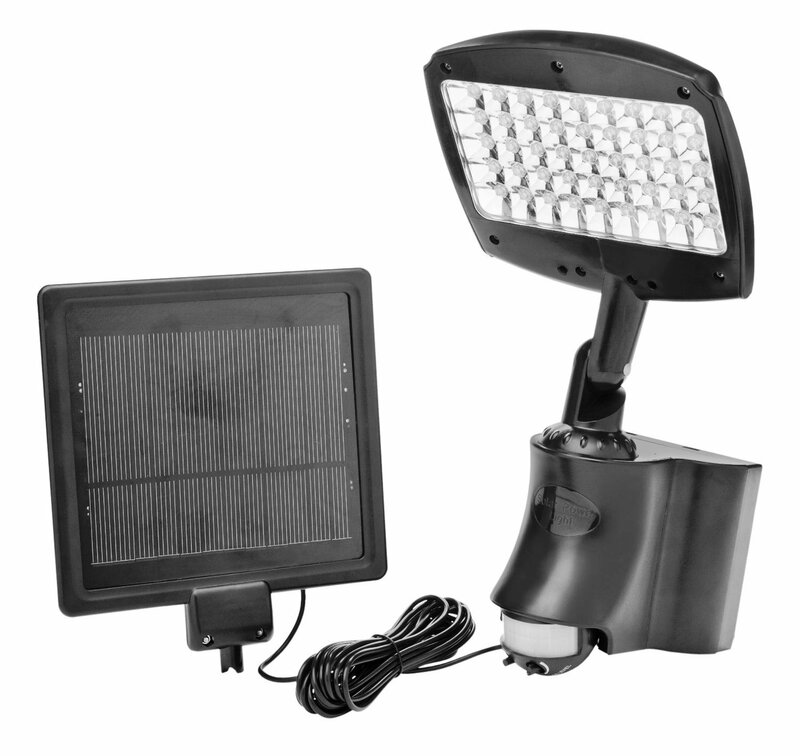 First of all lets start with the most popular solar security flood light – Sunforce 82156. This led solarsecurity light has got 60 bright LED diodes that together produce 850 lumen light output. The work time for this light with one charge is 30 minutes but the battery capacity is 900 mAh. The main advantages of this solar flood light are the low price, brightness and a large illumination area as well as a manufacturer that has got a good reputation and can help you if there are any problems with you fixture. 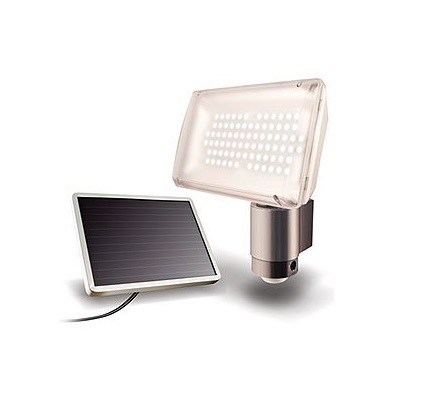 There are some minor disadvantages like plastic mounting hardware, but in general, everything else with this solar lamp is on top level and you will certainly not regret buying it for its great price. Model 82080 is another contender from Sunforce and it is a floodlight that has 80 LED diodes and a power output of about 900 lumens. This specific floodlight can detect motion up to 30 feet (9 m) away from the fixture and that 1 W Amorphous solar panel can be put up to 15 feet (4.5 m) away to get the best possible sunlight. This Sunforce product has 900 mAh Ni-Mh battery-pack that consists of 5 AA battery’s and that means that you could change them easily if their charge-recharge cycles run out. This 82080 light fixture is very easy to install and because of those LED diodes it will run for years and years to come. Overall this is a very well built and powerful security floodlight and the price and ascetic look are just right! This eLEDing EE836DE security solar flood lights is also very popular among other flood lights. Many people are using this flood light outside their houses, in garage and in backyard. eLEDing EE836DE solar flood light has got 36 bright LED diodes. The work time for this light in manufacturers website is indicated to be 2400 minutes and battery capacity is 800 mAh and that means this solar powered flood lights can easily last all night with one charge. 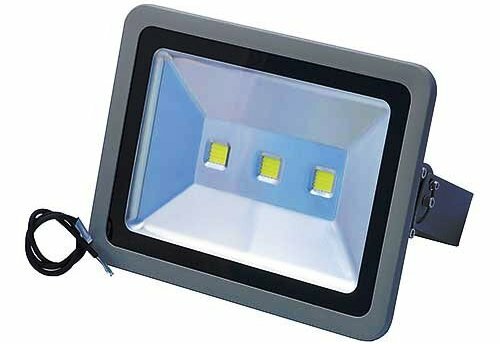 We are recommending this flood light because it looks good and may be the best choice if you need a smaller flood lights, because it only has got 36 LEDs not 60 or more, like many other similar lights, and it has got a well known manufacturer – EE Systems Group, which has a very good reputation and will handle any faults or problems you might have with you light, and if necessary, will send you a replacement. We chose Designers Edge solar security flood light because it has a solar panel as well as an additional power cord for attaching this light to main power source to charge the batteries. This security flood light also has got a good looks, and will look good used in many outdoor or indoor places. It uses 45 bright white LED bulbs, and will work for 120 minutes with a full charge. The flood light uses two AA rechargeable batteries that has got 3600 mAh. These batteries can easily be replaced when they worn out with new batteries and comparing this light to other flood lights, who have accumulators that cannot be find and replaced so easily this has a great advantage. There are only few minor disadvantages for this flood lights where the main one is that it is made from plastic, but so is many other solar security lights, so it is not such a drawback. All in all, this is a great solar security fixture for any indoor or outdoor usage. 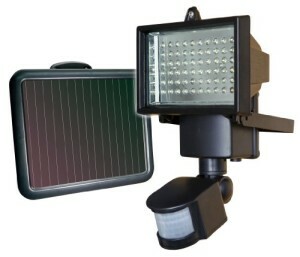 This solar security flood light stands out of others with its beautiful design and build quality. Its an all in one fixture flood light and this means that solar panel and motion detector are built into flood light itself. This gives a better and more compact look for the whole security light, but also reduces number of places, where you can set the light, because solar panel is attached to the flood light and cannot be placed separately from the light. eLEDing EE860DT solar security flood light has got 60 LED diodes and the work time for this flood light is 4200 minutes. Battery capacity is 1500 mAh. This security flood light has got many advantages – its very bright, has got a great build quality and a really good design. It also is resistant to weather and has got other useful functions like “smart-on” that dims the light down to half a brightness. 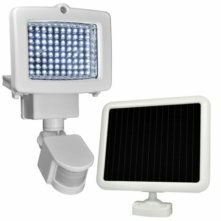 As mentioned before, the manufacturer of this solar flood light – EE Systems Group, has got very good reputation and will sort out any problems, if there are any, and will replace it with a working one if that is needed. We chose MAXSA 40227 solar security flood light, because it has got both great looks and is very durable as well as made with aluminum housing. The manufacturer MAXSA has also made other good quality solar flood lights, and is well known solar powered ligthing manufacturer. 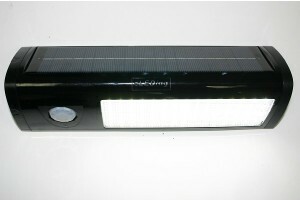 This specific solar security fixture can produce decent light output and has got 80 bright LED diodes. Solar panel is charging three 2100 mAh rechargeable batteries that can easily be replaced if needed. It can also illuminate a large area, and is the best used outdoors, because of its durability. 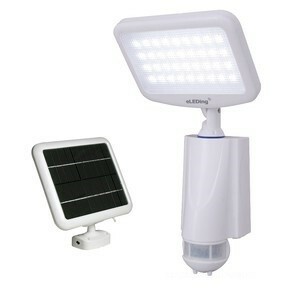 We can say, that this is one of the best outdoor solar flood lights that you can purchase at the market. And the last contender in out solar security floodlight top is the Maxsa 40226 solar powered floodlight. This product has 80 LED diodes that produce around 330 lumens but can sustain that light for about 120 minutes in a continuous manner or 150 time activation’s with 1 minute long lighting intervals. This Solar security floodlight has a 4 Ah Lead acid battery and an Amorphous solar panel but it can also detect motion for up to 40 feet (12 m) away. Overall the 40226 model is a very appealing product because it has a great price and the performance is also acceptable. In summary we can say that each one of these solar security flood lights are good in their ways. Some are best for larger outdoor areas and more extreme weather conditions, some are better for smaller places, other looks better or can be used inside with addition power cord. Nonetheless, these are the best security solar flood lights that we have picked to be the best for any indoor or outdoor usage and we hope this article will help you to choose the best one for your place. If you would like to know more about these or other solar flood lights, please visit other pages of our website.